While saving Hyrule has traditionally been a one hero job, multiplayer adventures have become a fan-favourite subset of the Legend of Zelda series since Four Swords made its début in 2002, and we were ecstatic to see The Legend of Zelda: Tri Force Heroes - an all-new co-op title for three players - revealed in Nintendo's Digital Event at this year's E3. Judging from the impressive queues on the show floor, we weren't alone - Tri Force Heroes is perhaps the most popular 3DS game on show at the Nintendo booth, and we had no trouble assembling a team of three to take on a dungeon in a fantastically fun test drive. We began our session by voting on a level to play - our team all happened to pick the opening Forest stage, but votes are randomly selected ala Mario Kart 8 if there's any dissent. Destination set, we moved onto the most important decision of all: what to wear. 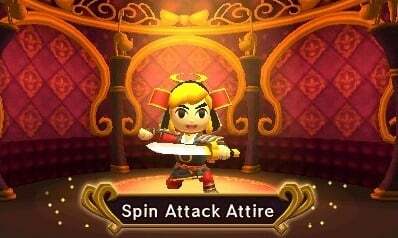 Tri Force Heroes takes a page from the Denpa Men playbook in assigning an important role to your fashion choices; each outfit will grant you different bonuses in-game, in addition to any aesthetic qualities you might otherwise appreciate. There were six ensembles to choose from in our demo, and we went with the Zelda dress - bright, breezy, and conveniently capable of making Heart pick-ups appear more frequently. Each dungeon in Tri Force Heroes is structured into four main sections, and when we jumped into the Forest stage we started out separated. The first puzzle was to find each other - which we did, after an accidental out-of-bounds from the weakest Link (yours truly) - and then 'Totem up' to reach a floating balloon with the key to the next area. The Totem mechanic plays with the sense of vertical depth brought in in A Link Between Worlds, and fits in very well with the 3DS' stereoscopic sensibilities: by walking up to a fellow Link and pressing 'A', you can hoist them up on your shoulders in a sort of Tri Force totem pole, while a third Link can then come along and carry to make a tower three-heroes high. The top Link in a Totem can interact with off-the-ground elements - whether by sword, bow, or boomerang - and many of the puzzles we've seen in Triforce Heroes so far rely on this three-tiered arrangement of vertical space. After grabbing the key and stepping on the Triforce-shaped portal leading to the second section of the dungeon, our team was met with some solid hack-and-slash action in a room full of ChuChus. Combat here felt great, both with the classic sword and the bow (assigned to 'Y'), and we made short work of the wriggling mob before moving on. The third area presented a puzzle, and proved much more challenging. Here we were meant to activate three different switches on high pillars, all of which were guarded by enemies and surrounded by a dark abyss and moving platforms. These switches would snap shut if we got too close, too, so we needed to find a sweet spot in order to hit each one - tricky business in the absence of solid, stationary ground. Hitting all three switches required real coordination: it took a Totem formation with the bottom Link walking and aiming, the top Link firing an arrow at the right time, and the middle Link providing crucial height - less agentive, but no less important. Everyone needed to be on board in order to pull it off, and once we finally managed it - after taking several hits on our shared (!) heart meter - the feeling of accomplishment was wonderful. That trial behind us, we moved on to the fourth and final area of the Forest, where we were greeted by the dungeon's big villain: an enormous electrified ChuChu. 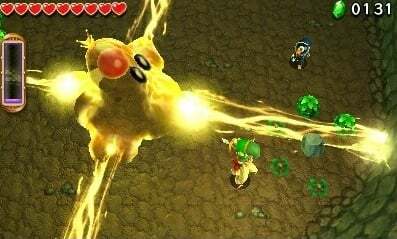 A see-through yellow blob with a red weak spot inside, the boss attacked by sending steady streams of electricity out from four sides - since we were still low on health from our struggles with the previous puzzle, these were a real threat. By this point in the demo, we were coordinating almost automatically, so right away one Link started running around hunting for hearts while the other two went on the offensive. After we'd successfully peppered it with enough arrows, the blob reared up for round two, bringing its weak spot up off the ground with it. This meant we had to Totem up two-high for the next hit, and three-high for the eventual third, which marked the end of both the boss and the dungeon. As in the puzzle section earlier, bringing down the boss took a lot of teamwork, and though the actions required from each player were fairly basic - move here, carry or be carried, fire - it came together into something special, and was incredibly satisfying. Of course, strategizing is one thing when you're standing next to your squad, but what happens in Tri Force Heroes' online play, when you won't be able to talk to your team? As it turns out, the noisy E3 show floor simulated the online experience rather nicely, and our team hardly did any talking at all as we worked our way through the Forest. Instead we relied on the touch screen, which lets you instantly broadcast one of eight different messages onto everyone's screen, from "Over here!" and "Throw!" to "Carry me!" and "Thumbs up! ", in the form of incredibly appealing icons that look a bit like Link-themed LINE stickers. Some of the available images help with practical concerns, like the Totem request or Throw suggestion, while others are more for fun. 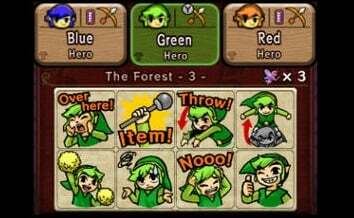 The cheerleading Link quickly became a favourite amongst our squad, for instance, and having all three players spamming it in celebration after beating the boss was surprisingly heartwarming - in an especially nice touch, rapidly tapping this icon animates it, rather than simply resending it. There's definitely room for interpretation in the symbols - I became the least popular Link in the room when I misjudged a teammate's 'Throw me!' request as an invitation to fling them at the boss (they were asking to be let down from a Totem) - but that's absolutely part of the fun. Along with the stickers, the shared health meter goes a long way towards explicitly encouraging truly cooperative play, and that gives the game a very different feel from Four Swords. Teamwork is truly front and centre, and though it was already great fun in the early stage we played through, things only seem to ramp up from there - we saw later levels where each Link was in charge of different items (boomerangs, bombs, etc. ), and we can only imagine the devious dungeon designs still left to come. Even from our brief time with Tri Force Heroes, it's easy to see why it's been a show floor hit here at E3 - it's classic overhead Zelda combat and puzzle-solving with a feel-good co-op focus and a great sense of style, featuring colourful cosplay and a soon-to-be iconic set of Hyrulian emoji. Even the aesthetic feels like a fresh mix; while at first it looks quite similar to A Link Between Worlds, the Toon Link influence makes a big difference, and there's a love of colour on display that recalls the Game Boy Advance or GameCube Zelda entries. We had a great time teaming up in Tri Force Heroes, and can't wait to explore more in the final version - here's hoping our future teammates can forgive the occasional misguided toss. This looks great and hopefully turns out to be a good game. I knew there was a reason to hype this one up. Definitely one I'm on the lookout for now, great write-up. They really did a terrible job showing these games off in the Digital Event. This actually sounds pretty decent, and while I'll still be waiting to see reviews on this one, it sounds pretty good based on this write-up. Good read. Definitely getting this game when it comes out. My only problem with this game personally, is that in order for me to play with my two sons, I need to spend $120+. I've always loved Four Swords-style games and it looks like Tri Force Heroes will be another one of those! I really like the communication buttons on the touch screen; those are the kind of shouts that Splatoon could use. The game has online play so I greatly look forward to the game's release! With online, this is a must buy for me. Man, I think I'm actually quite interested in this now. It sounds pretty awesome, actually. So what's the goal of collecting rupees in this game. In Four Swords, you get special medals if you collect the most. Is there a practical use in this game for them (at least that we know of)? Wait what? This game has online!? I thought Federation Force must have been a fluke for sure .... now I'm impressed. Definitely going to get those two then! If Nintendo could only put online up for StarFox, maybe take a little extra time to polish up the GFX of it as well, and this E3 would be "saved" for me, as far as Nintendo goes. I mean I saw the GIR#FE footage on Treehouse, and that looked totally cool. I want it more than Xenoblade now. Considering all the other previously announced games like Fatal Frame, Devils Third and so on, I think they really are about to bridge the gap between WiiU and NX just fine, not to say exceedingly fine, even without a Metroid proper! I would imagine that the different outfits would cost Rupees at a shop of some kind. I have trouble finding friends to play, so unless there's Download Play or random online multiplayer, I'll pass. ...just like Federation Force. That game is getting a lot of unnecessary hate just because of bad timing. This game should have been bundled with Zelda: ALBW. It's basically a multiplayer game using ALBW's graphic. 4 swords was free, this should be free as well. @Spectra_Twilight Wow, I didn't know that. Thanks for the heads-up. They're not the biggest Zelda fans...yet, but I am; and we like playing co-op games together. This one is perfect because it's for 3 players. Four Swords Adventures for Gamecube is probably a better analogue for this new game than the GBA mode attached to A Link to the Past. The GBA multiplayer mode had only 3 or 4 levels and could be cleared in about an hour. FSA-GCN was a separate retail release and it had a full campaign of 24 levels. It's much deeper than the GBA mode. Even in single-player, it's a great experience that will take hours to complete. Considering that Nintendo is planning this as a full retail release, I imagine it's going to hew pretty close to the Gamecube game's model. @Nintendian They have only been working on this after they finished with A Link Between Worlds at most, so of course it couldn't have been included with it. @dkxcalibur Wasn't it confirmed that this title will have download play? If so, you'll probably need only one copy of the game. Unless you can form a team like how it happens with Splatoon then I have zero interest in this. Zelda for me is all about the single player experience. It's fine to tack on a multi-player element, but the game has to be driven as single player. @Jairo_MC Someone else already posted that. That's great news that I didn't know. I might be interested in this then. @CTs_Lieutenant You can play the entire game alone if you so choose. Multiplayer isn't mandatory. @Moshugan I bet you that this Tri Force Heroes was meant to be a multiplayer game in Zelda:ALBW. They rushed to get it out leaving the multiplayer as a future consideration for DLC, then they developed it to such an extend that it becomes a standalone game. This sounds very much like the original Four Swords. Sounds good! Have to say, it's nice to get a Zelda game this year. I hope it doesn't just feel like a side mode and more like a complete Zelda game. Makes not hearing Zelda Wii U kinda worth it. @Nintendian Well, it's possible, but it's already 1,5 years after ALBW was published. This just reinforces my belief that Nintendo's issues Tuesday were in the presentation, not the games themselves. The games look great. As if I wasn't already hyped enough! So do you need 3 players to play in multiplayer or is it possible to have 2 human controlled players and one computer controlled? Sounds absolutely fun! I'm glad we can play single player, I'm always have trouble with online. @Dr_Corndog Absolutely. Horrible pacing, weak presentation, absolutely too much time spent on certain games (cough Super Mario Maker cough), too little time spent on other things... I still feel that the actual game line-up could've been stronger, but the presentation was truly the problem. @Nintendian I bet it didn't happen like that. See how easy that is? I hope this one does well, but I don't think it's my bag. I've wanted an updated four swords for a long time so I'll have to take a serious look this. Problem is hardware costs. Also, I really think that intro video in the digital event did a poor job of showing it off. It looked like it was still in alpha stage development to me. Not sure why. Same with Federation Force. Both of these games leapt a huge amount when seeing them played in the live treehouse demonstrations. Yeah, I had fun with this one at Best Buy yesterday. We tried the forest temple and died a couple times while in the first totem room, but we did beat the demo. I'll probably be getting this one at some point. Wow! That sounds really fun! I can't wait to try it out. I'll admit, I'm much more excited about this game now after reading the article than I was during E3. My biggest problem with these sort of co-op games is that I don't know anyone near me who also has a 3DS, so it's great to hear that you were able to play it with strangers in a noisy E3 hall without needing to speak. I'm really not a fan of online for portable games, and I doubt I'll find 2 other people in the same place and same time who want to play it, so I wonder how the single player holds up, but if it does I'm in for this game. Over 10 years since last Four Swords game, this is a very welcome addition to Zelda series. Does this game use L & R buttons, or is it just moving and A,B,X,Y? All i'd want is for Legend Of Zelda: Four Swords to come to Nintendo 3DS as a FREE gift before Legend Of Zelda: TriForce Heroes. This would be a nice edition to those who have missed out in the past years. Watched the Treehouse footage and it looks very fun. Hyped for this one. Art style-wise, a cross between A Link Between Worlds and the Wind Waker-esque toon Links seen in Four Swords? How can so few people see the unadulterated WIN in that? Also, a spiritual sequel to Four Swords Anniversary, in that not only it has multiplayer, but a single player mode as well. And for the three-player limit? Who cares?! So hyped for this the nostalgia of playing Four Swords with my bros.
@wetdagger They confirmed that the game will only have three player co-op. That is really disappointing. I wanted to play the game with my daughter, now we are not getting it. Yeah, this looks cool, but there's no way I'm spending more than £12 on it, especially if everyone needs to own a copy to play. If it ends up being a fully-priced retail game then its a definite skip from me. @dkxcalibur idk if some one elce has sed but it has Download Play (onlu use one Game Card) unless your talking about getting new 3DS's. Im looking forward to this game as iv realy enjoyed the 2 (as 1 is a remake) for sword Game's Also im very happy nintendos being allot more Open to Online play az basicly everyone i useto game with has moved away (some a howl day's Travilng away) so this is grate. Looks pretty solid and considering that there really hasn't been a bad Zelda game I have no reason to doubt the quality of this game either. TL:DR - is this game multiplayer only? Why can't it be four people? I know that's too tall for totem but can't the 4th player just walk aside? @dkxcalibur i think it has download play so one copy should be fine. Just like "Ampersand" also said. I also have a daughter myself for whom I wanted to get the game to play together with. For that reason you cannot play local co-op with 2 people, I will neither get the game. Nintendo don't seem to consider and reconsider their gamedesigning decisions and is therefore losing a lot of potential customers. They seem to follow that path more and more.